Great article…had me searching around for a while. TWAdmin, you need Windows 8+ or Server 2012+ with RSAT to manage IE10 GPP policy settings. What you’re seeing is correct on Server 2008 R2. I have 2008r2 with IE11. I installed the latest IE ADM/MX and I cannot seem to manage IE11 browsers. What is the best course of action? I cant seem to think that I would need to upgrade the server to 2012 just for a policy. Gary, see my reply above. There’s no way to get those options on 2008 R2. 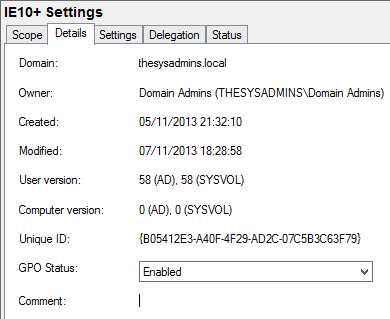 Easiest way to enable access to those policies is to use a Windows 8 machine (or above) with RSAT installed. So your suggestion is to go around to 500 computers and individually install this RSAT what ever the hell that is? No thanks. Not even close to a proper solution, and spending 1000’s on new serves to keep up-to-date with web browser is about as ridiculous of a solution to date. MS is beyond lazy with these browser updates, they seem to fail to look at the bigger picture, which is I’m sure is on purpose. No. The cheapest solution is to have one Windows 8 or above machine with RSAT installed (Remote Server Administration Tools) to manage the policy. You do not have to install RSAT onto the machines you are trying to manage. I have 6 DCs, 2 of them are 2012 and I can see the IE 10 option. However, the other 4 servers are 2008R2 and they only show IE 5,6,7 and 8. My question is, if I create a IE Preference for Windows 10 on the 2012DCs, will it be processed anyway even though the users get connected to the old 2008R2 DCs ?? Yes, the policy will still be applied. Are you completely sure it will be applied anyway ? 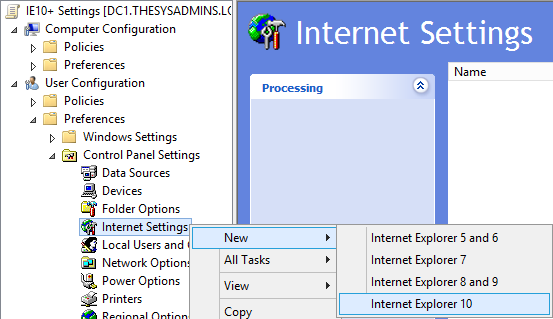 I just made a policy (modifying some proxy settings) using a 2012 DC, I created 2 settings, one for IE 10 and another for IE 8/9.. since our company is using either IE 8 and IE 11. After doing it, I checked on the xml file locally, and I could see both texts, one that says “min 10 max 99” and the other one at the bottom that says “min 8 max 10”. Thing is, I went to check the same xml file on one of the 2008DCs and the only text that was copied to that SYSVOL was the “min 8 max 10” version. That means the only portion of the policy that was copied to the 2008 SYSVOL was the IE 8/9 one. What should I do ? Thanks!!!!! Forget about the latter message, the text on the XML is copied entirely on all DCs, no matter if the DC is either 2008 or 2012. I will try out the policy with 2 Lab PCs we have (one with IE8 and the other with IE11). I will let you know the outcome. Thanks!!!! !